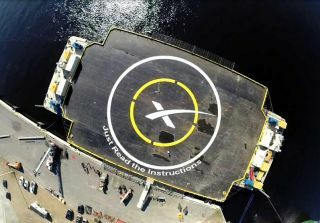 SpaceX's autonomous spaceport drone ship, named "Just Read the Instructions," is designed to be an offshore landing pad for the company's Falcon 9 rocket. SpaceX aims to land the Falcon 9's first stage on the ship during the DSCOVR satellite launch on Feb. 10, 2015. "Tuesday will be a busy day, but SpaceX has planned and prepared for this scenario," SpaceX representatives told Space.com via email. "We have separate operations and recovery teams on both coasts, so we are equipped to handle both events simultaneously." Fins used to help steer and stabilize the rocket stage ran out of hydraulic fluid during the attempt, SpaceX's billionaire founder and CEO Elon Musk has said. Engineers have taken steps to make sure that this doesn't happen again, but success Tuesday is far from assured. "Rocket re-entry will be much tougher this time around due to [it being a] deep-space mission," Musk said via Twitter Sunday (Feb. 8). "Almost 2X force and 4X heat. Plenty of hydraulic fluid tho." Indeed, the $340 million DSCOVR mission (short for Deep Space Climate Observatory) is headed toward the Earth-sun Lagrange Point 1, a gravitationally stable spot about 930,000 miles (1.5 million kilometers) from Earth. SpaceX did not originally intend for Tuesday to be so busy. The DSCOVR launch was scheduled for Sunday (Feb. 8), but weather concerns and a glitch with the Air Force's radar tracking system delayed the liftoff by two days. Dragon is finishing up its fifth official cargo run to the space station for NASA. SpaceX holds a $1.6 billion contract with the space agency to make 12 such flights using Dragon and the Falcon 9. The company is also developing a crewed version of Dragon under a separate NASA contract.